Work is progressing steadily on the signalling project, our last major item planned for Wallerawang. The heart of the system, the signal control boards, were finished in early January. 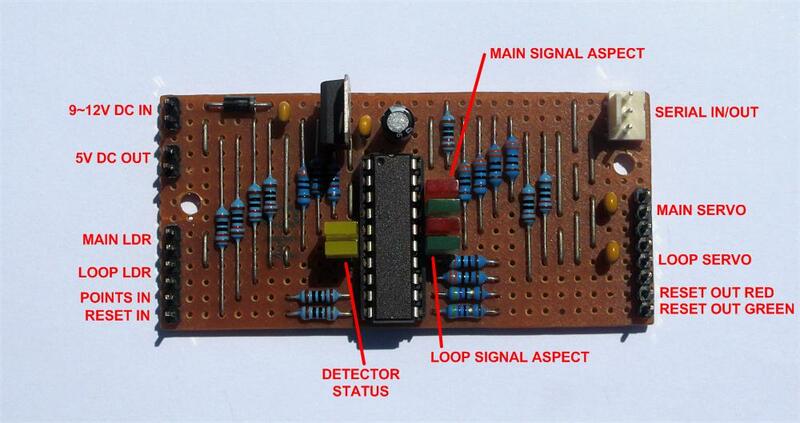 Powered by a PICAXE microcontroller, each board has the ability to drive two signals, which can be either of semaphore or coloured light type. The system was designed to provide the most realistic and reliable signal automation for an exhibition layout where trains mostly run in a loop. While out of the scope of its intended operation, the signalling control could be adapted for bi-directional single track lines. In addition, as most of the inputs and outputs use digital logic, the boards can be connected to other circuits to provide for more complex trackwork and interlocking scenarios, or even automatic train control. One of the ten signal control boards used to operate semaphore signalling on the Up and Down main lines. For each main line, the signal boards are connected in a daisy-chain fashion, the output of one board indicating the status to the next board along the line. Joining the boards in this manner allows for any number of signals along a section of track and only one wire is needed between any two boards. A simple logic is followed: if a signal is instructed to change to green, then the signal in front of it should also be told the same, making all of the signal aspects along that section of the line green. Where there is a set of points along that section, the signal for the wrong road (ie: the direction the point blades are not facing) will always be red. The reset inputs and outputs are linked between the boards and are used to propagate the signal status. A combination of these pulses are then used to control the signals for an entire section of track. 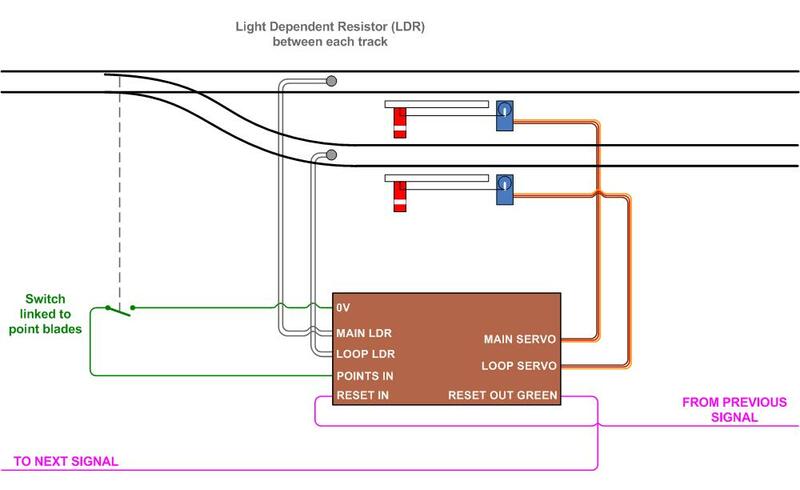 An animation showing the operation of the signalling system for a loop of track. As a train leaves the storage yard, it is detected and the yard reset output changes all the signals from red to green. The train then travels along the line and the signals change to red accordingly. When the last signal along the line changes to red, it sends a reset to the yard signal board, setting it back to green in readiness for the next train. 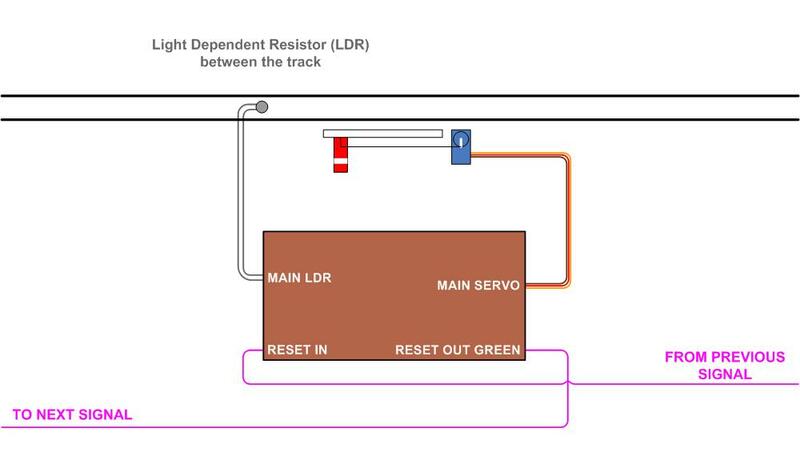 Light Dependent Resistors (LDRs) are used to detect the presence of a train. Apart from the storage yards, our layout has its own lighting so the amount of light falling on the LDRs is consistent. As there are no connections to track power for detection, trains can continue to operate if there is any issue with the signalling system. The LDRs are mounted between the tracks between two sleepers at ballast level, their small size and colouring making them unnoticeable. The signalling program takes into account variations in lighting - it constantly reads the ambient light level falling onto the LDRs, and uses the latest readings for determining detection. Around every five minutes it also reads the light levels when a train is detected, then also uses these readings. A diagram showing the connections for a single signal. For clarity the DC power wiring has been omitted. This diagram shows the wiring where there is a set of points. A switch is connected to the points, which indicates the direction the point blades are facing. Two LDRs are used, for train detection on each track. For clarity the DC power connections have been omitted. The operation of the storage yard signal control board differs slightly. The points_in pin is not used for monitoring the position of points, instead a pushbutton is wired to it, providing a manual reset function so that the signals can be reset to green at any time. Locomotive 4303 on a mixed goods is about to pass the proceed signal on the Down Main. The main line signal has two brackets, the second on the right is for a dummy signal which protects the Mudgee line branch at the real location. 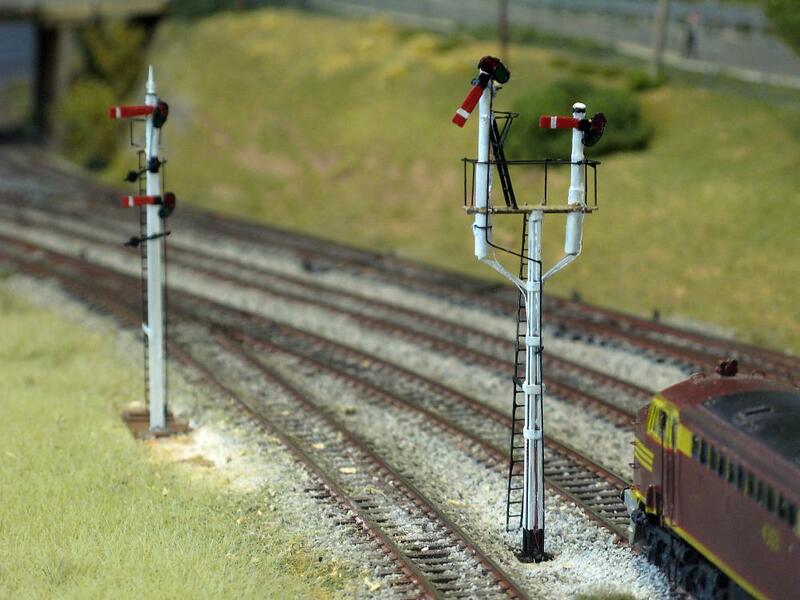 To the left of the main line signal is the signal post for the Down Refuge (the lower arm on it also being a dummy for the same reason). One of the auxiliary switches on a Tortoise point motor connected to the points just in front of the signals is used to indicate their direction, and thereby influence the status of the operating arms.